Artist's illustration of Japan's Akatsuki spacecraft at Venus. A robotic Japanese spacecraft gets a second and final chance to orbit Venus today (Dec. 6), exactly five years after the first attempt went awry. 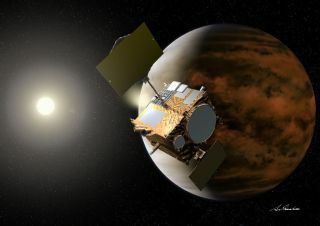 The Japan Aerospace Exploration Agency's (JAXA) Akatsuki probe was supposed to begin circling Venus on Dec. 6, 2010, but its main engine conked out during a critical orbit-insertion burn and the spacecraft went sailing off into space. Now, the time has finally come for Akatsuki to try again. MIssion controllers likely won't know for a few days whether or not today's manuever was successful, JAXA officials said. The $300 million Akatsuki spacecraft (whose name means "Dawn" in Japanese) launched in May 2010 along with JAXA's IKAROS (Interplanetary Kite-craft Accelerated by Radiation Of the Sun) probe, which became the first craft ever to deploy and use a solar sail in deep space. The original plan called for Akatsuki to enter a 30-hour orbit around Venus, and then study the planet's clouds, weather and atmosphere for at least two years. The mission was designed to seek clues about how Earth's "sister planet" ended up becoming so hot, and so seemingly inhospitable to life, JAXA officials have said. Akatsuki should still be able to achieve most of its goals if today's maneuver goes well, according to JAXA, but the mission will be quite different in several key aspects. For example, Akatsuki will be eyeing Venus from much farther away on average than originally planned. The highly elliptical new target orbit has a period of eight or nine days instead of 30 hours, and will take the probe as far away from Venus as 186,000 to 250,000 miles (300,000 to 400,000 kilometers), compared to 50,000 miles (80,000 km). There are currently no active spacecraft on or around the second planet from the sun. The European Space Agency's Venus Express orbiter, the last operational probe, ended its mission in December 2014 after eight successful years, performing a death dive into the thick Venusian atmosphere after exhausting its fuel supply. Akatsuki is Japan's second-ever interplanetary mission. The first, the Nozomi Mars probe, failed to enter orbit around the Red Planet in 2003.